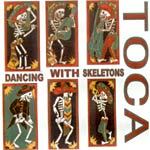 Toca is a live fusion band consisting of Xololanxinxo, Tommy V, Ceschi & David of Anonymous Inc, backed by live musicians. This is not your typical 'hip hop' band/group, and actually it shouldn't be labeled at all. This is music, plain and simple.